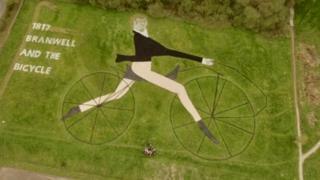 A giant image of Branwell Bronte riding a bicycle has been voted the best piece of land art at this year's Tour de Yorkshire. The artwork measured 260ft x 210ft (80m x 60m) and was created with the help of local schoolchildren at Haworth Primary School, West Yorkshire. Made with recycled materials, it marked 200 years since Bronte's birth and the invention of the bicycle. It was one of about 50 land art creations which celebrated the tour. The 304-mile (490km) cycle race drew an estimated two million spectators for its third outing in spring. Much of the artwork was so big it was best viewed from the air. The winning artwork, designed by Andrew Wood, used 3,000 plant pots for the outline of the bike, pieces of an old marquee and "grass-friendly" paint. Branwell, the brother of famous Bronte writers Charlotte, Emily and Anne, was also a writer and painter but after a troubled life with drug and alcohol dependency died in 1848, aged 31. The family lived at the parsonage in the village of Haworth. Mr Wood said: "I have always wanted us to do land art that would link Haworth and cycling." Almost 4,500 public votes were cast for a shortlist of 12 pieces of art, organiser Welcome to Yorkshire said. The Tour de Yorkshire began after the county hosted the 2014 Grand Depart of the Tour de France.